John is a singer/songwriter/guitarist based in the Detroit area, known for his mix of introspective and funny songwriting, as well as his improvisational guitar work. 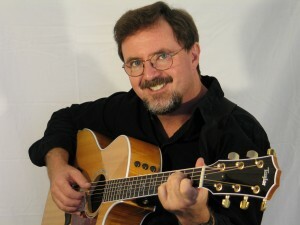 A guitarist since age 6, and a songwriter since age 15, John has been performing publicly since 1978. After years in original and cover bands, he moved to performing his own acoustic material in the early 1990’s, and hasn’t stopped since. John performs extensively, and has hosted several successful open mics in the Detroit area – most recently at Farmington’s Mentobe Cafe. He is also in demand as a side musician, and has performed and/or recorded with Jere Stormer, Ben Hassenger, Luti Erbeznic, Tracy Kash Thomas, Charlie Monterey, Mike Dorn, and the Delta Twins. And he currently performs in a duo with fellow singer-guitarist Sharon Tse. John’s music has been heard on Kelly Brown’s “Homeboys” show on WRIF in Detroit, as well as A3 Radio’s “Folk It!” and Pam Rossi’s “Live From UDetroit Cafe” online shows. His online songs have been downloaded and played all over the world- including 10,000 + plays in Afghanistan by our troops during the the Afghanistan/Iraq war. His songs have also been featured on the playlist of Dutch National Radio. In 1999 he released his first CD for his own BFE label, Observations & Complaints – a lushly crafted album painstakingly recorded over 18 months. His second, demo-style-with chops CD, Make It Good, came out in June of 2001. This CD features forays into both rock and folk styles, and includes the hit “Refrigerator Science Projects”. And his 2002 offering, Sweet Oblivion, is another self-recorded disc, but with digital equipment. His subjects on this CD include the local music press (“Name in the Paper”), a Very Famous Celebrity (“The O.R.P.S. Confusion Blues”), hope (“Glory Up Ahead”), regret (“Sweet Oblivion”), and September 11th (“A Sky That Wasn’t There”). Land Of The Living (Sept. 2004), showed him continuing his exploration of new arrangements and subjects. Heartbreak and hope are explored in “Nothing At All” and “A Song Of Hope”, respectively, as are engagements (“I Wish You Well”), and writer’s block (“Between The Paper And The Pen”). Electric guitars dominate the rocking title cut and his take on politics and current events (“Mercy”). And, for the stately “Off The Ground”, he multi-tracked his own voice into a 9-piece choir. John’s 5th CD is currently in production, and will include songs that have already become popular requests, “The Ballad of Touchdown Jesus”, “Wolverine”, and the already-notorious “Suicide Squirrel”.